Whenever I get organic oranges, I always remove the zest and keep it to dry. You never know when it might come in handy, in a cup of tea, grated and sprinkled in fruit salad, in a cake, mulled with wine. With winter wrapping up, a new found interest in my spice drawers along with a Christine Ferber compendium from the library on my knee, I have been thinking chutney. It's a good thing I saved those orange peels. There's a quick way to dry them, if you're thinking chutney too and don't have any dried orange zest on hand. Just pare the zest off a well scrubbed orange and place it on a cookie sheet in your oven at the coolest temp setting for an hour or so. Once particularly delicious looking recipe for chutney calls for the ingredient épice à pain d’épices. There are so many varieties and recipes all over France, it would be impossible to give a definitive formula for the mix of spices that make French spice bread. It really differs by the household. But since I have re-done the spice rack and am prepared to start with my own mixes à measure for my recipes instead of buying mystery jars with formulas meant to maximize commercial return to someone else, I want to hone down the possibilities on a house version. Duck foie gras and mango compressed terrine served with wedges of pain d’épices. Enough to get you licking your chops yet? Remove the seeds from the cardamom pods. 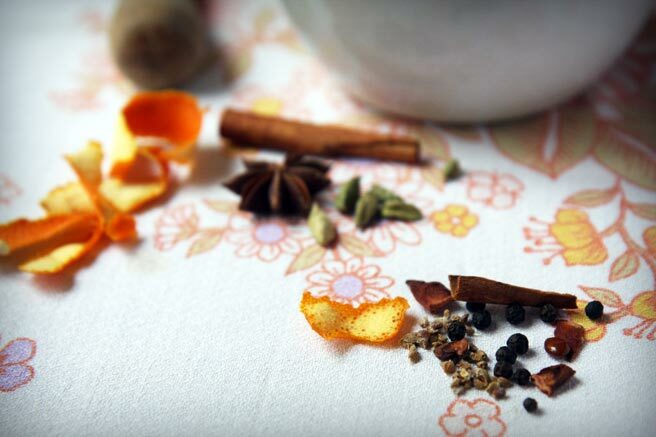 Place the spices and dried orange zest in your grinder and give them a whirl, or crush with a mortar and pestle. Use in your chutney aux fruits secs or pain d’épices. Between this and gfron's chocolate couscous today, I've a lingering undertongue tingle akin to sniffing the French's jar. We got in a big box of "ordered" spices yesterdy and opened it this a.m., and I'm awash in the heady aromas, and now in your words. Thanks for the idea. I have a tree full of oranges right now. Do you have a recipe you like and would share for pain d'epices? Thank you for your kind comments, friends. Mary Beth, I worked on that in January and will continue on that project because I still don't have the absolute perfect recipe. As soon as I have one, I promise I'll share it. I LOVE that you keep the zest. Paying attention to using everything we have without wasting is something really important to me that I learned by example from my obaachan (Japanese grandmother) and a qulaity I appreciate in others. I'm so happy that you posted the ingredients of the epice a pain d'epices. I always wondered what goes in it. Now, would you be so kind and post the recipe for the bread itself? Or it's somewhere in your blog already, but I couldn't find it. By the way, have you made, or even eaten all these dishes that feature the pain d'epices. They sound so exotic. Thanks again for your wonderful blog. I enjoy it greatly, even if I'm seriously behind my reading.